Hawaii Big Island Lava Field Into Subdivision. By Alan D. McNarie. In 1958, when Hawaii statehood was still a year away, two Colorado businessmen came up with a brilliant money-making scheme: Buy 12,000 acres of undeveloped, dirt-cheap land on the rocky, rainy slopes of the world’s most active volcano, divide it into 4,000 3-acre lots, and sell them for $500 to $1,000 apiece, paid off at $150 down and $8 a month. Glen Payton and David F. O’Keefe called their subdivision “Hawaiian Acres.” It would forever change the face of the Big Island — not always for the better. 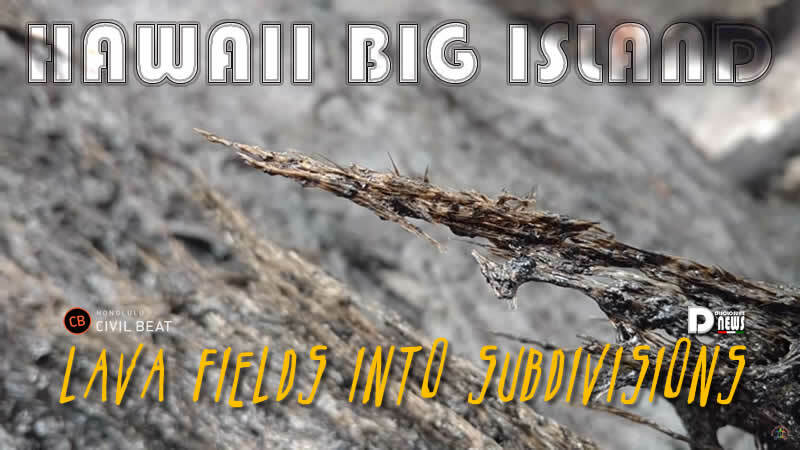 A Big Island land boom was on. In the article, Leilani developer Kenneth W. Ing claimed that “volcanic risk” to his development was essentially less than one in a thousand. Since then, lava has obliterated at least four more nearby communities and subdivisions: Royal Gardens, Kapa’ahu, Kaimu and Kalapana. Now, it’s the turn of Leilani Estates itself, which so far has lost 36 structures, including at least 26 homes, to the latest East Rift lava event. As of Sunday more than 2,000 people have been evacuated from Leilani Estates, Lanipuna Gardens and other nearby locations. 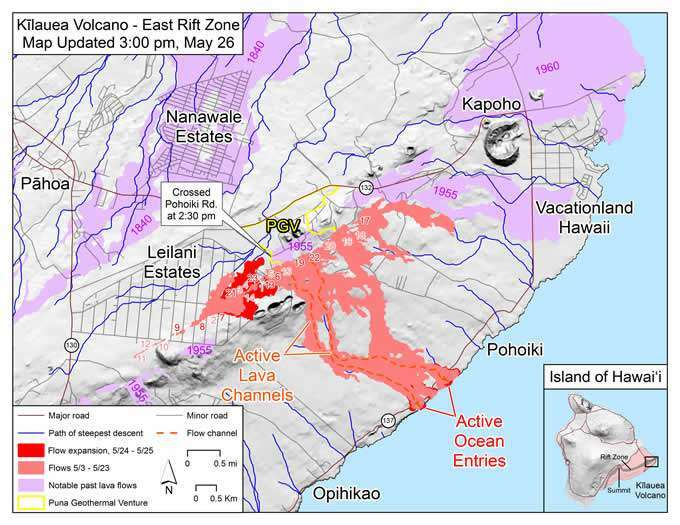 Underground magma is believed to be moving further down the rift, threatening other communities such as Kapoho, parts of which have been redeveloped since the 1960 eruption into three coastal subdivisions, Kapoho Beach Lots, Kapoho Farm Lots and Kapoho Vacationland. Cooper and Daws note that by the time the Big Island land boom wound down in the 1970s, 80,000 new lots had been created on an island that, at that time, held only 80,000 people. Then-Gov. John Burns spearheaded the drive to transform North Kona and North and South Kohala into what Burns called a “gold coast.” It remains a region of rich resorts and upscale homes. Other developers pumped money into resort hotels along Hilo’s Banyan Drive. But Puna and Kau became a playground for the wannabe-rich. Those three districts, located on the slopes of Mauna Loa and Mauna Kea, lacked the Gold Coast’s white sand beaches and relentlessly sunny weather. And those pesky eruptions kept making new land — but it was lava and volcanic ash, too hard and raw to be paradise. Most of these subdivisions were “substandard,” having a grid of private roads that didn’t meet county building codes — perhaps paved, perhaps not — and lacking basic services such as running water and sewer lines. Many eventually joined the island’s power grid, but most still rely on rainwater catchment tanks, and on cesspools or septic tanks to dispose of waste. They also lacked visible means of financial support. Most were located far from jobs. Though usually zoned agricultural, they were carved into parcels too small for conventional farms, even if they actually had tillable soil. Some subdivisions had a general store, but there was no traditional town center, no hub of commerce. County officials had a huge incentive to go along with the land schemers: a windfall in property taxes from those thousands of new lots. In 1987, Frierson asked then-Hawaii County Planning Director Albert Lono Lyman why the county had acquiesced to all those substandard subdivisions. Some subdivisions were the work of mainland investors. California oil company magnate Jack Crawford, for instance, built Ocean View Estates on old lava flows in Kau. But there were plenty of local players, including state officials. Hawaii County police inspector William Kamau headed the hui that tried to build a failed subdivision called Crescent Acres. State Sen.
Kazahisu Abe headed the Hilo Development Inc., which developed Orchid Isle Estates in Puna. 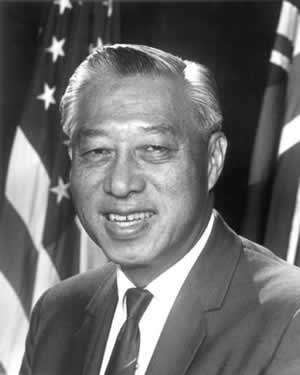 U. S. Sen. Hiram Fong was president of the company responsible for a development called Fern Estates. Nor was the greed limited to local bigwigs. 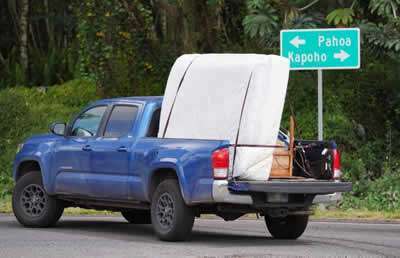 Cooper and Daws estimated that one in four Big Island families invested in lots. Big Island money in the lots was dwarfed, though, by outside investments: 12 percent of the lots bought by 1975 were by Big Islanders, 35 percent by Oahu residents, and most of the rest by mainlanders. With almost no provisions for basic infrastructure, the original investors didn’t appear to actually believe people would live on those lots. But thousands of people proved them wrong. By the time the subdivision boom finally petered out in the 1970s — partly as a result of stronger zoning and planning ordinances, but also, perhaps, because of the sheer glut of undeveloped lots — East Hawaii held at least 15 major substandard subdivisions and several smaller ones — all of them located in Lava Risk Zones 1, 2 or 3, the three highest-risk categories given by the U.S. Geological Survey. One cluster of subdivisions, including Hawaiian Ocean View Estates and Hawaiian Ranchos, clung to the lava field on the steep southern end of Mauna Loa. But most were in Puna, forming an almost continuous line from Volcano down Highway 11 to Keaau, then from Keaau down Highway 130 to the sea at the eastern end of the island. “They didn’t tell you the place sat right below an active rift zone,” Jack Thompson told Frierson. 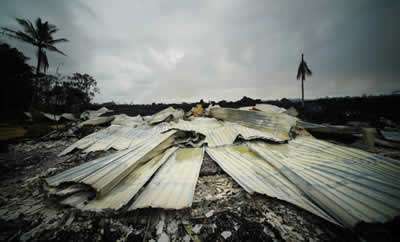 With the possible exception of Royal Gardens, which was wiped out by a series of lava flows between 1983 and 2012, every one of those subdivisions is inhabited — and many, especially those in lower Puna, are burgeoning, despite the lava risk and the lack of amenities. They’re the main reason why Puna is the fastest-growing district on the island. According to the Hawaii County General Plan, the district held about 31,300 people in the year 2000. By 2015, its population had soared to nearly 50,000. By 2020, it’s expected to reach 58,000, surpassing Hilo to become the island’s most populous district. It’s achieved that remarkable growth despite the loss of four communities to molten rock. Many more came because land speculation had driven prices sky-high in more desirable locations, and companies building those Kona mega-resorts hadn’t made provisions for housing their workers. The island ended up with much of its jobs on one side of the island and its affordable housing on the other side, generating another local term: the “5 o’clock derby,” for the early morning commute between Puna or Kau and the North Kona/Kohala resorts. “Poor people have to live somewhere,” noted one Puna Facebook user. 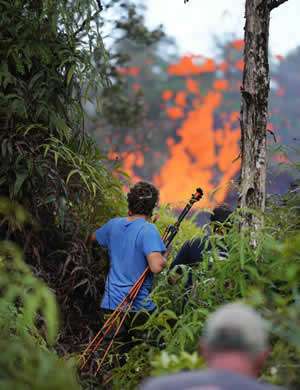 Many of these later buyers know about the lava, but they have to live with the risk, gambling that Madame Pele won’t come to their homes during their particular lifetimes. But the odds may be considerably worse than Dr. MacDonald predicted back in 1960. According to the USGS, in the 20 years between 1983 and 2003 alone, another 40 square miles were buried in fresh layers of lava. This entry was posted in Uncategorized and tagged Hawaii Big Island, Kilaeau, lava field, Leilani Estates, love, volcanic risk. Bookmark the permalink.